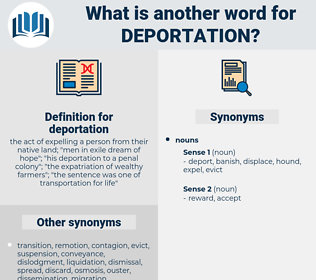 What is another word for deportation? 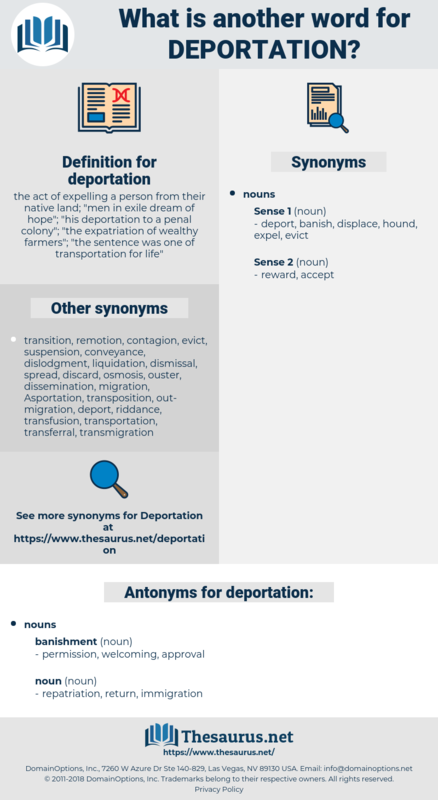 the act of expelling a person from their native land; " men in exile dream of hope"; " his deportation to a penal colony"; " the expatriation of wealthy farmers"; " the sentence was one of transportation for life"
Recommendations, extrusion, remoteness, 'expulsion, ouster, departure, detention, rendition, alienation, carry-over, return, estrangement, referral, rejection, termination, Restraining. refoulement, relocation, deportee, displacement, deport, removal, persecution. He must fight as a point of honour for his family and country; and in his case, even if he escaped on the field of battle, deportation was the least to be looked for. Again, the Labour members were creating difficulties both at Capetown and Westminster over General Smuts's Deportation Bill, which compelled the Government to amend its conditional banishment clause - a hardship that was not as vital or as absolute as the banishment clauses against black tenants in the Natives' Land Act. ejection, banishment, exclusion, riddance, proscription, expulsion.